Painting in the Valdettaro Boatyard. Valdettaro Classic boats, 40cm x 50cm oil on linen. 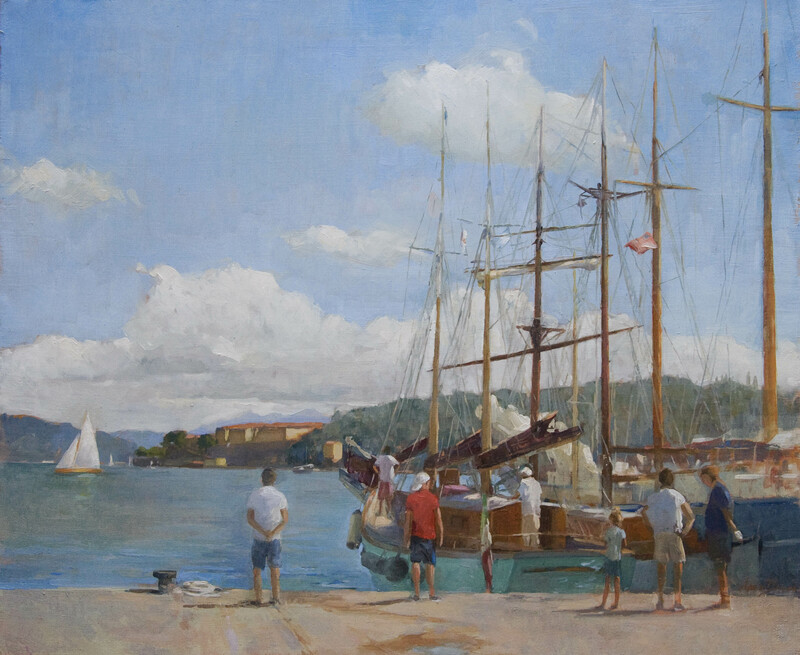 A couple of weeks ago I went to an outdoor painting exhibtion where artists were invited to paint in a local boatyard harbour here in Le Grazie in Italy that was hosting a weekend of Regatta of Classic boats. It was great fun to be able to see so many beautiful classic sail boats. The weather was fine, the wind was good for sailing and the people friendly – it was a great weekend! I dont really have much experience in painting boats and every boat I chose to paint in the foreground disappeared after half an hour so I never got to finish the masts and the rigging, a bit of memory was needed and also the help of the camera to remind me where to put the rigging was extremly helpful. It made me wonder how marine artists in the past were able to paint every little detail, it was either from memory or very careful sketching over long periods of experience spent in the boatyards. Mastering the art of human anatomy is probably the same sort of thing I imagine you would need to paint a boat. During the time I was painting I tried a new medium for oil paint: Poppyseed Oil. The advantage of this oil is that it doesn’t yellow like linseed oil and it dries very slow which was an advantage when I added the rigging to the boats back in the studio because the sky hadn’t dried and I was able to work wet into wet. When using poppyseed oil the painting should be finished all in one go instead of waiting for layers to dry as it will crack if the layers havent dried properly and used underneath linseed oil should be avoided. Linseed oil dries much faster, the only weak point is that when dry it tends to yellow or darken the whites and paler colours unlike poppy oil that is transparant. This is a very lovely painting ! I rarely paint with oil because I don’t understand the medium very well, so thanks a lot for the poppyseed tip ! Absolutely beautiful! I love everything about this painting. Great job! Amazing as always, Anna! What a great idea, to invite artists to an event like that. I would love to participate in something similar. This might be something I could tip the local art club about 🙂 Stunning work with the masts and all. Thanks Heidi, i’ve always wanted to partecipate in a painting event too and was envious by all the ‘plein air’ events in america or the UK, Italy doesnt have them so much unless its organised as private painting holidays so I was so happy to come across this local one! Yes definently you should do it too, i can imagine it would be very popular with all the beautiful landscapes in Finland! Thanks Rita, it was great fun, I hope that I can do more of these things next summer! Hi, Great painting. I have never really had a go with linseed or poppy oil. I was told they can be a bit shiny or glossy. I occasionally use some liquin….but most of the time its just turps. There is a great video on you tube Tom Keeting on painters. He talks about and shows how Turner painted rigging and boats! Thanks Ed! The video on Tom Keeting about Turner was very helpful, I admire Turners techniques and I haven’t come across Keeting so thanks for letting me know, I will definently be watching others, he is great! I see what you mean about linseed oil being shiny, sometimes I mix with 50:50 turps which is a bit more subtle. Thanks for stopping by! Previous Previous post: I Casoni in Liguria.